After a year on the crowded, reservations required, eastern side of the country, we set out to make this the summer of no plans. Other than a gathering for the eclipse in Stanley, Idaho, we had no obligations or commitments. Which meant we were free to roam as we pleased. And with the intention of staying (mostly) out of campgrounds, we had no need to make any reservations. Freedom! Looking back on the past few months, I have to say that it worked out quite well. 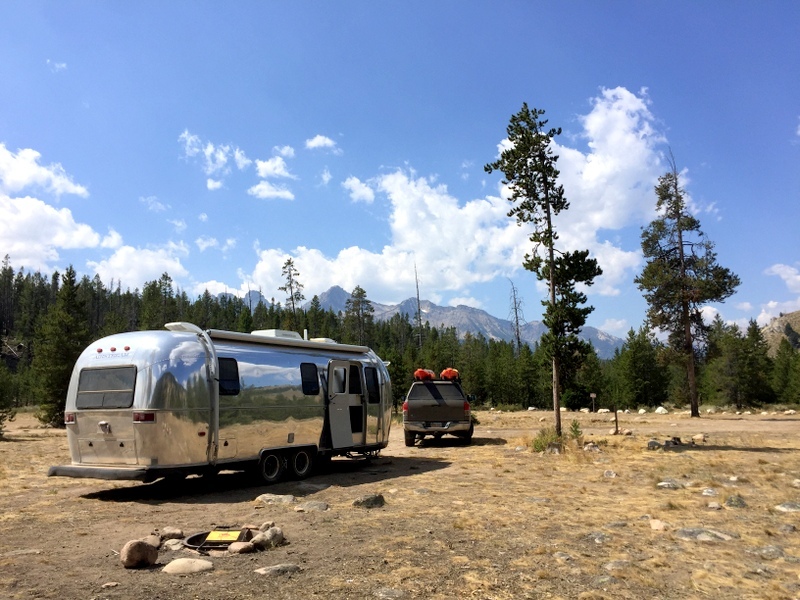 After a rather quick dash across the middle of the country, we spent a month in Colorado, three weeks along the Idaho/Montana border, two weeks in Ketchum, a month in Stanley, and a week in Boise. 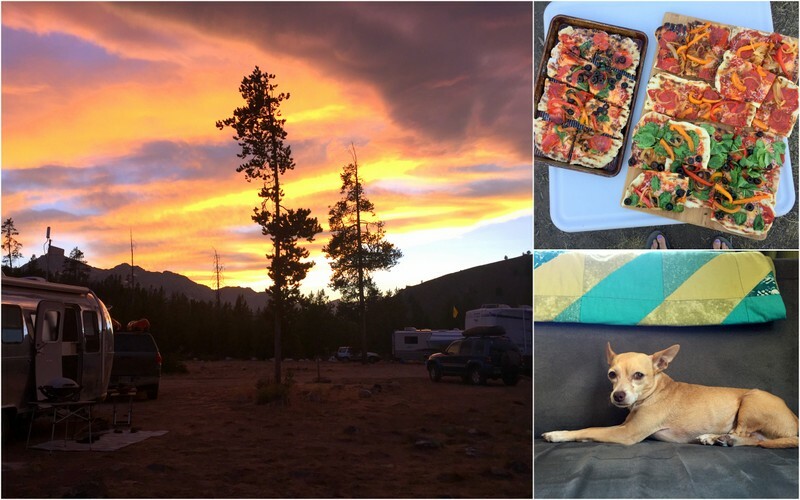 In that time we stayed in 2 county parks, 2 national forest campgrounds, 1 driveway, 7 boondocking locations and 1 private park in Boise (our only reservation due to the Labor day weekend). The best part about living reservation free is that it gives us the opportunity to arrive somewhere, decide we like it and hang around as long as we want. Which is exactly what happened in Stanley. After the two-week eclipse gathering, most of the group dispersed, but we felt like we weren’t quite done exploring. 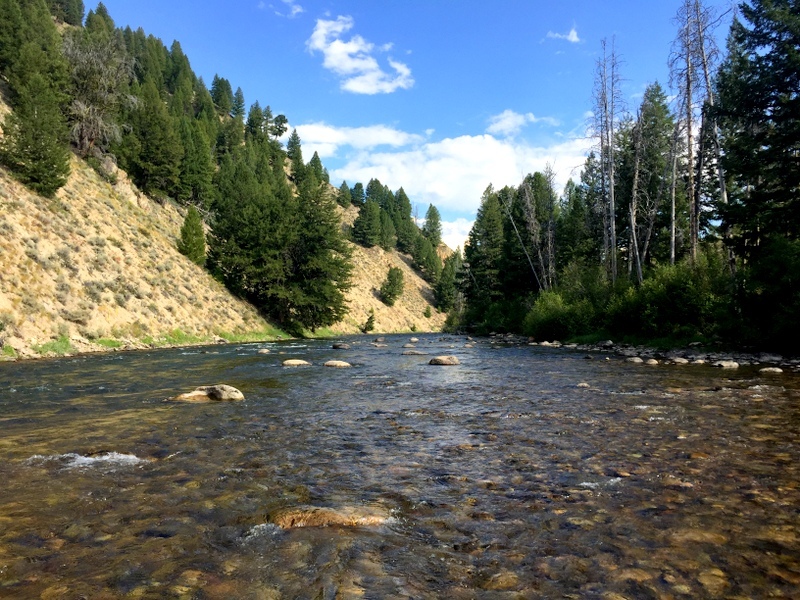 So we moved over to a boondocking spot along the Salmon river and settled in for another week. 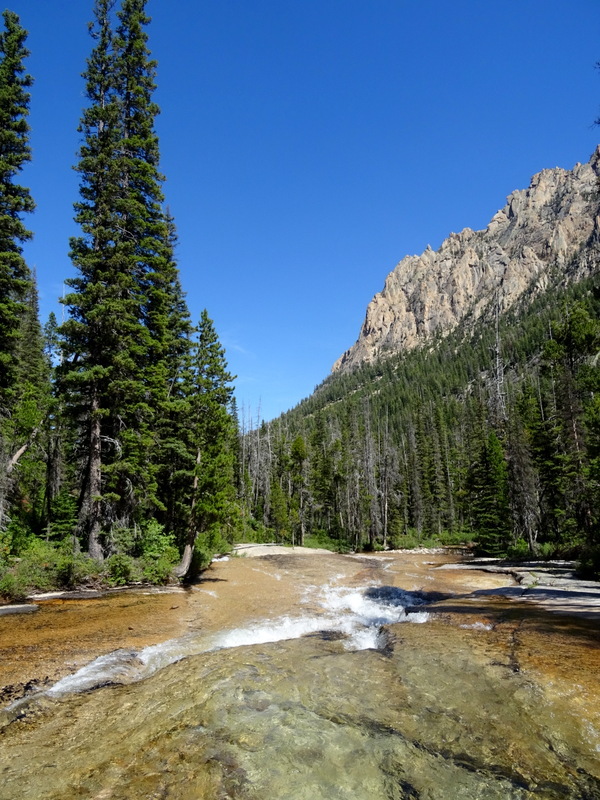 This area was dirtier and noisier than the eclipse location, but with mountain views and the sound of the river flowing past it was hard to complain. 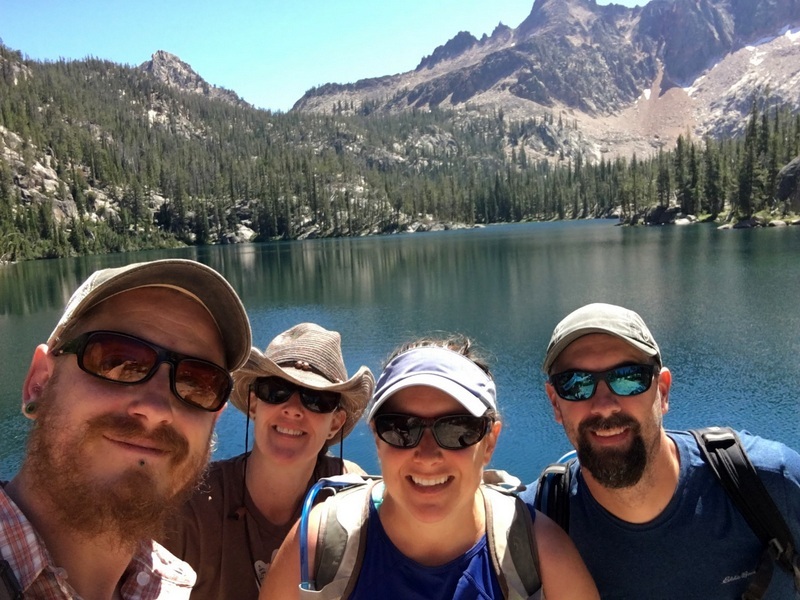 Two couples from the eclipse group — Jenette & Eric and Beth & Taylor — also moved to the new location and we enjoyed a relaxing week of casual socializing. After spending weeks with a large group it was a relief to only have four other people around with no obligation to make nightly appearances. This past year has been crazy on the social scale for us and we (mostly me) have struggled at times to find a balance between meeting new people, developing & maintaining friendships, staying connected with family, and craving alone time. 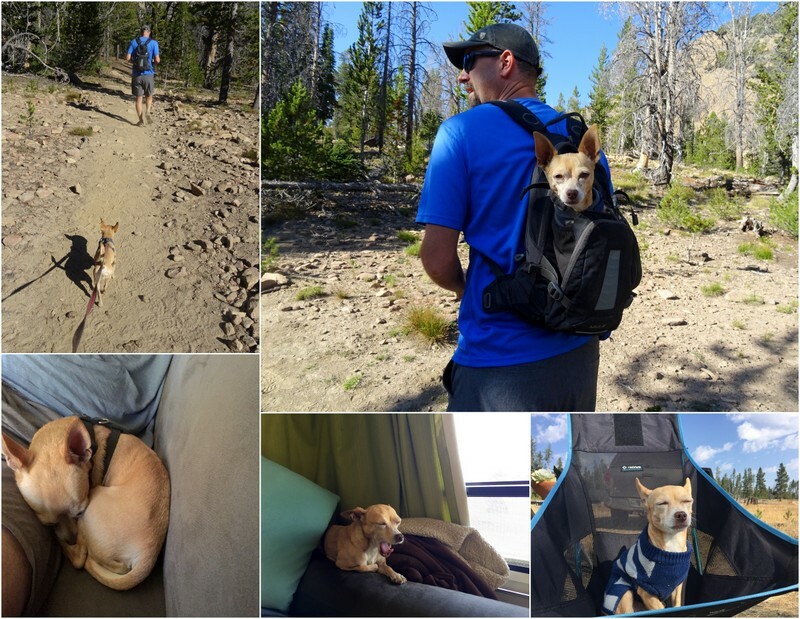 After feeling exhausted and overwhelmed by the eclipse gathering, this last week in Stanley proved to me that I really do like other people – but prefer them in small batches :) Oh yeah…and we spent the week dog sitting for the cutest 7-pound chihuahua named Logan. 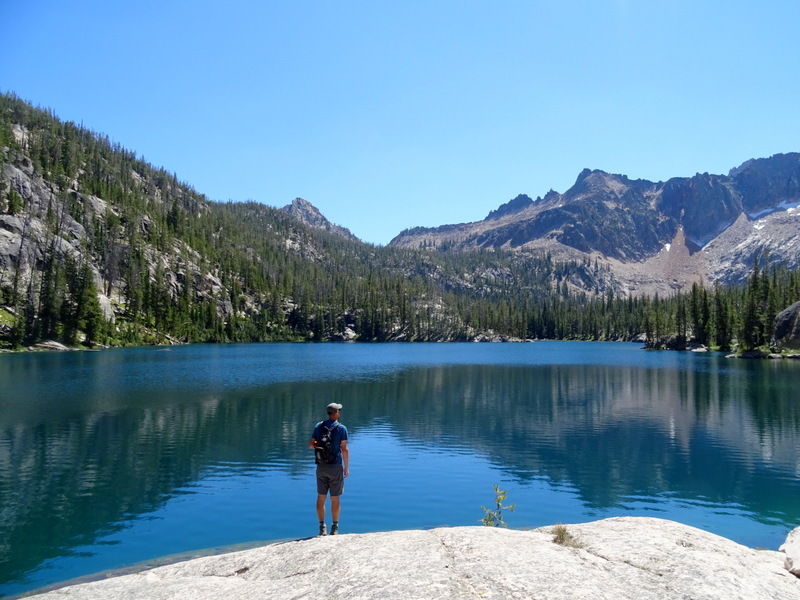 One of the reasons we stuck around for another week was to hike the Alice Lake trail. It was one of the last hikes we did in Stanley, and I suspect it will long be high on our list of all time favorite trails. 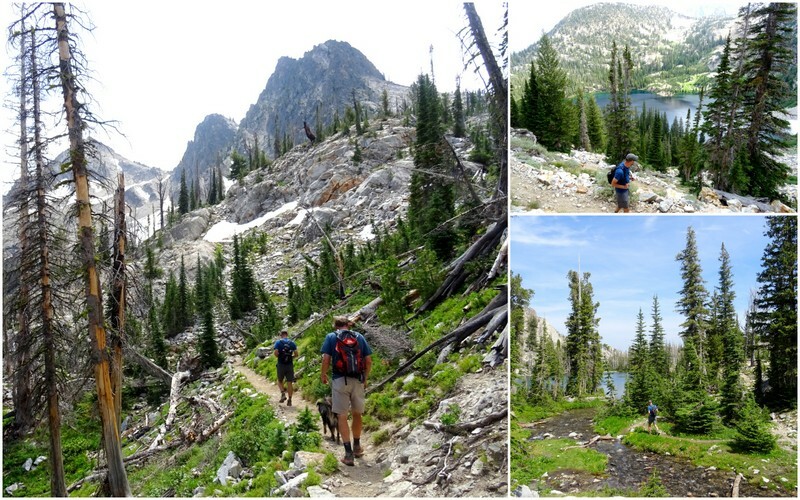 The trail to Alice Lake is actually part of an 18-mile loop that travels up and over the Snowyside divide and past eight lakes. 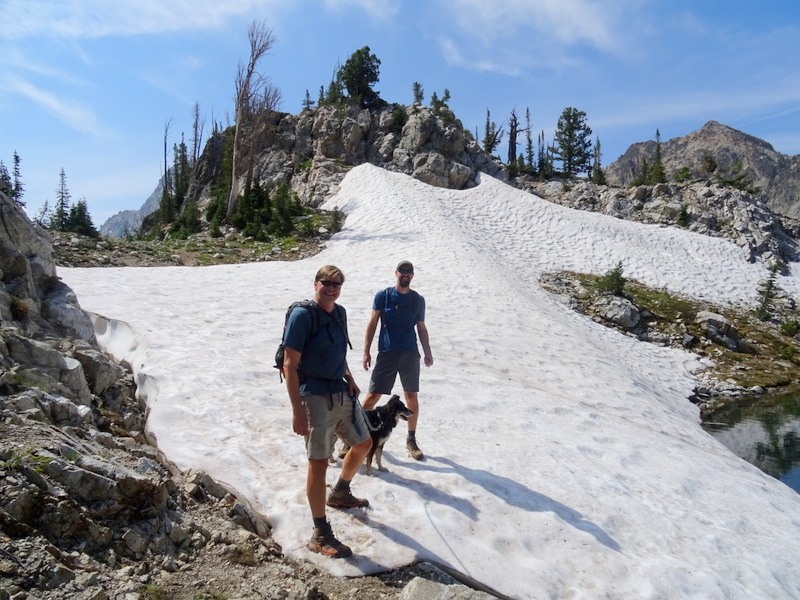 Early in the summer, we thought we might hike the entire loop in one day. Eventually, we realized it was simply too far for our poor feet to handle. Also, we heard that the current conditions on the back side of the loop were very dusty, and not all that scenic as it travels through a recently burned area. 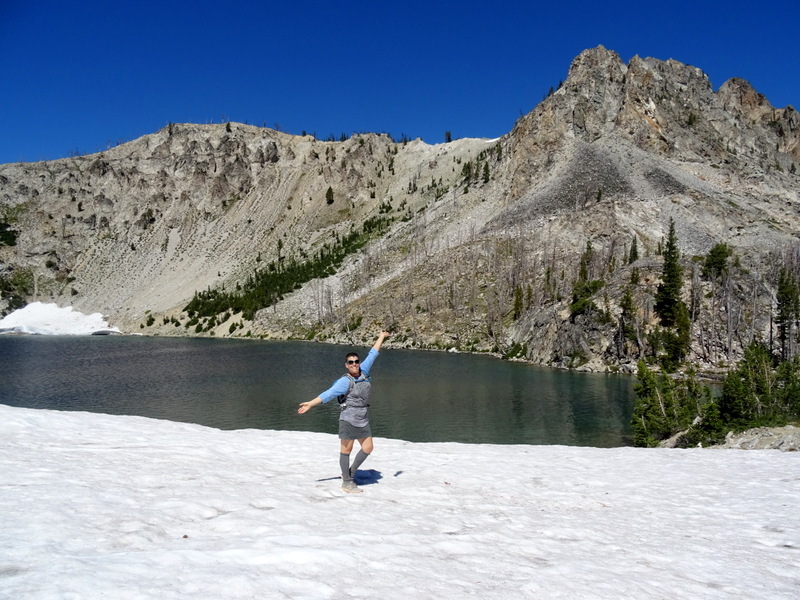 So instead of pushing ourselves, we simply hiked until we reached the Twin Lakes and then turned around. The hike still clocked in at almost 14 miles with a 1,700-foot elevation gain (which is long but not that steep). In retrospect we probably could have managed another 4 miles, but only if the payoff was going to be spectacular. Whose idea was it to take sunglasses off for this photo? I’m pretty sure this area has forever raised the bar for amazing hiking trails. 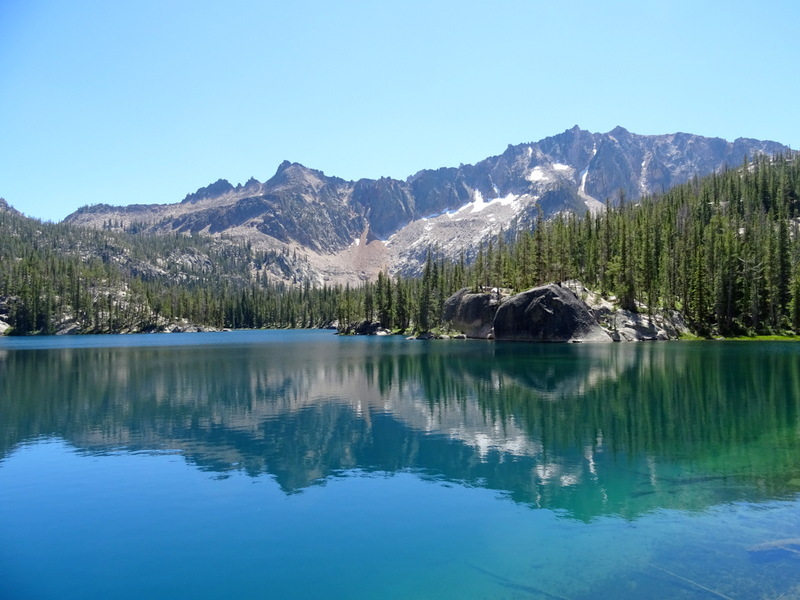 With peak after peak of jagged ridges dotted with turquoise alpine lakes and flowing waterfalls, there is no shortage of incredible opportunities for hikers and backpackers. 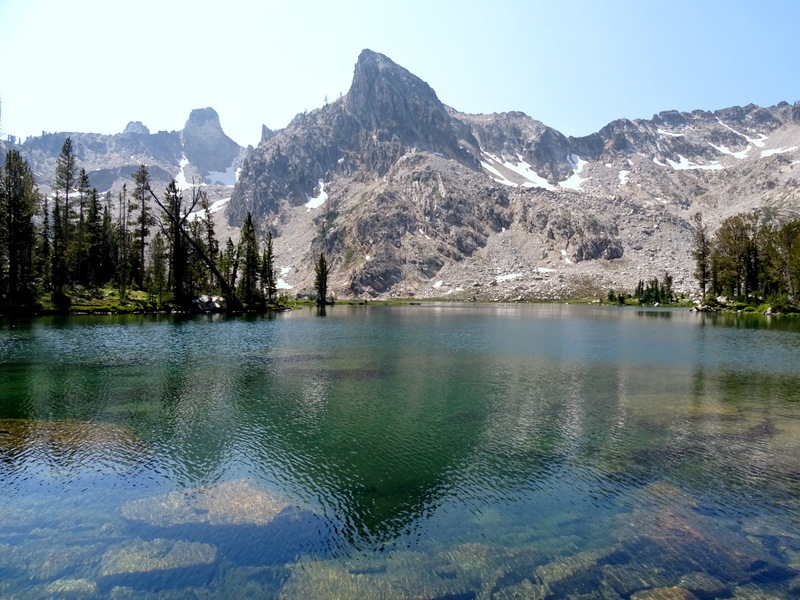 If the scenery isn’t enough, the Sawtooths sweeten the deal by residing at a lower elevation than many of the mountain ranges in Colorado. 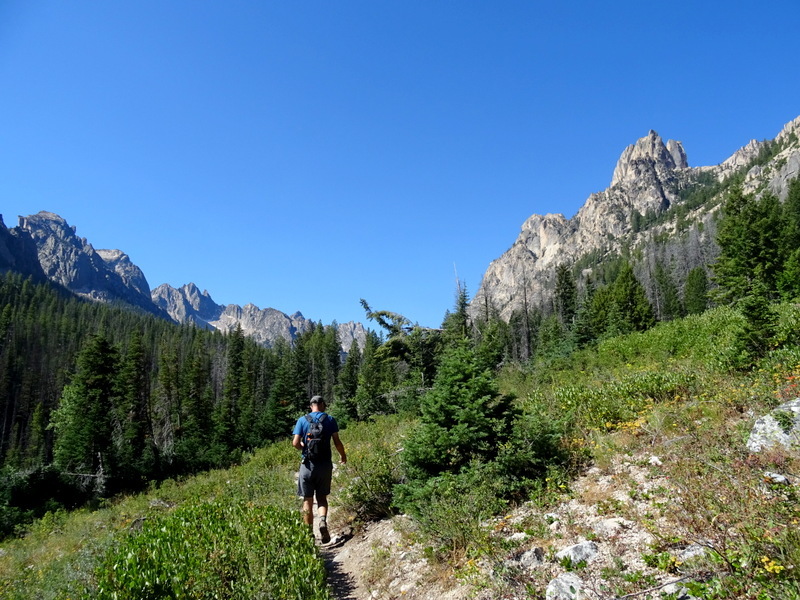 So instead of starting at 9-10,000 feet and going up from there, most trails start at 6-7,000 and climb to 8 or 9,000 feet. For us, losing those last few thousand feet of altitude really made a difference in our hiking abilities. 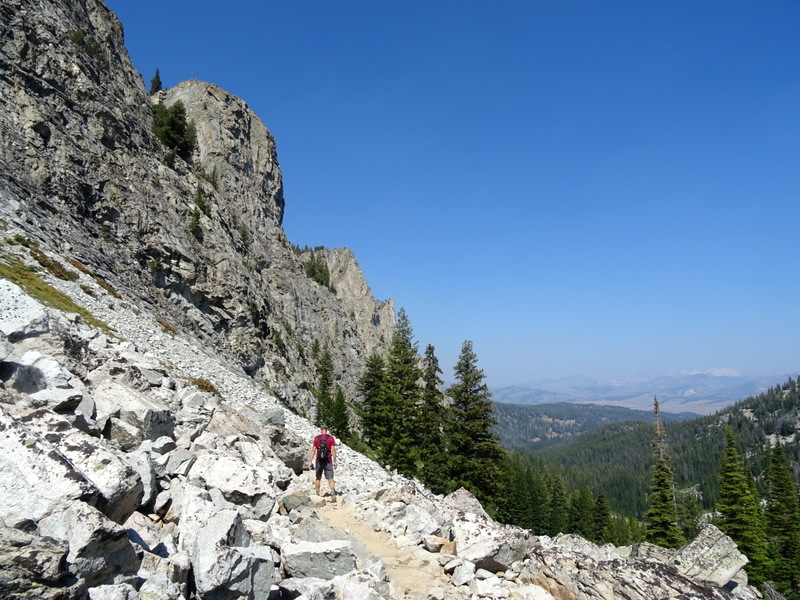 The other favorite in the Stanley area was the Sawtooth Lake trail. 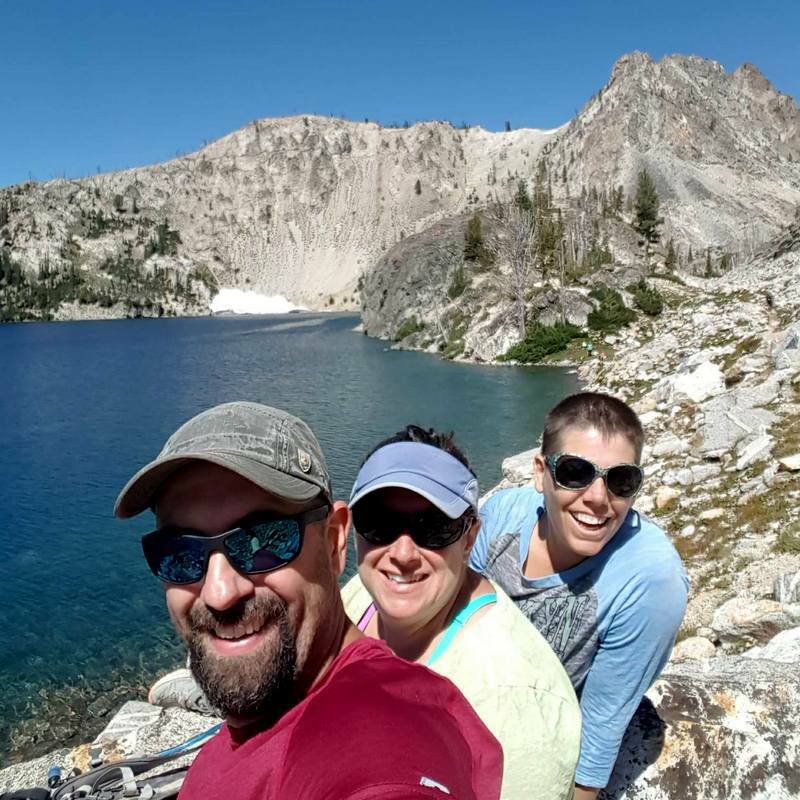 In fact, we liked this hike so much that we did it twice! The first time we were joined by our friend Deas and his enthusiastic pup Jake. The second time our friend Jill came along for the journey. 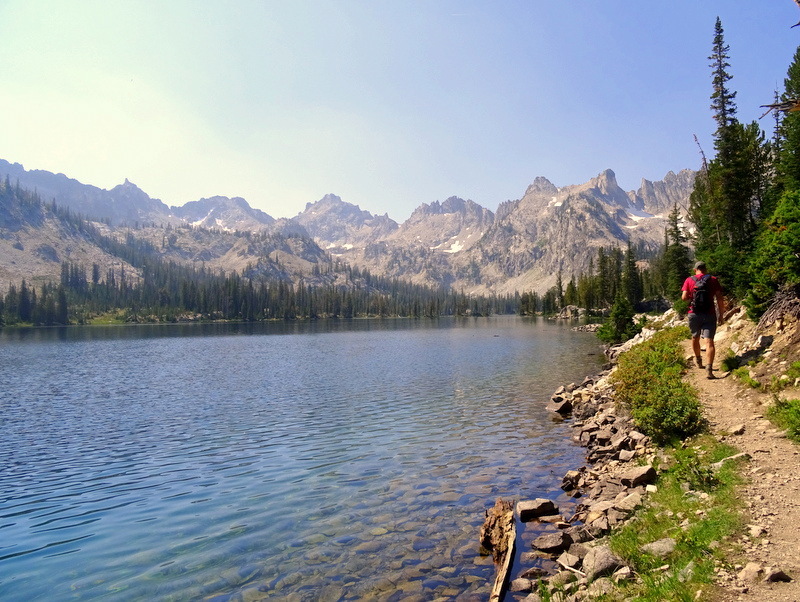 Sawtooth Lake is one of the more popular trails in the area. At 9 miles round trip with a 1,800 foot gain it lies firmly in the moderate range. 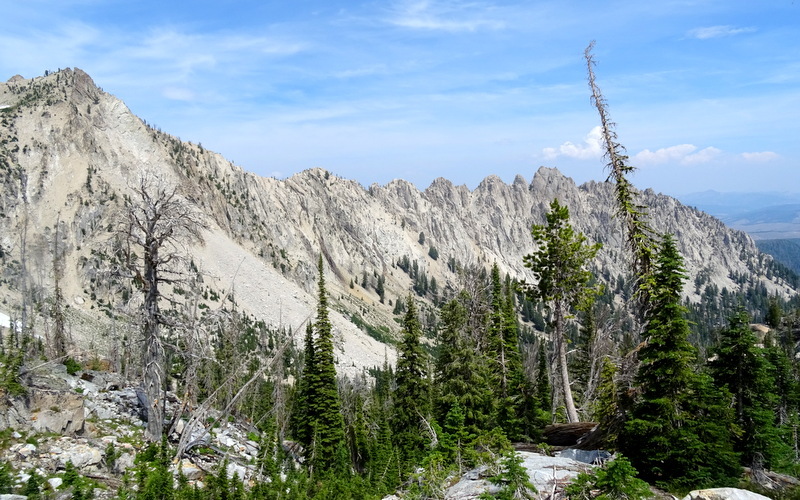 In fact, the first half is only slightly uphill, and it’s not until you reach the switchbacks near the top that you really feel like you’re climbing. For this reason, it’s a busy trial with lots of families and dogs. 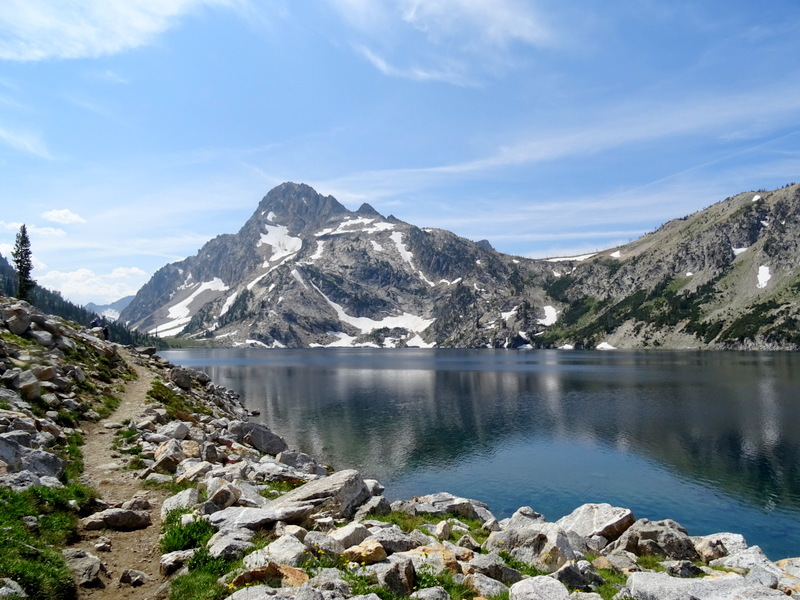 The trail splits off onto other routes and continues past the lake which makes it a popular backpacking route, so I would suggest getting there early if you want to find parking at the trailhead. 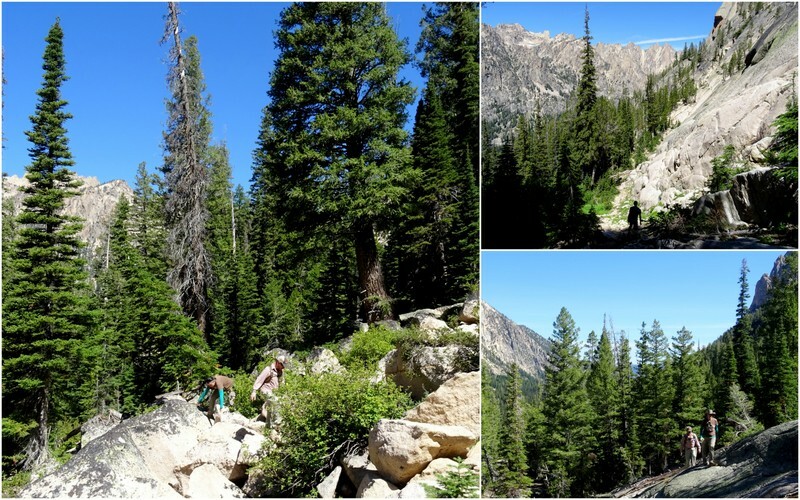 Our third favorite hike in the area was the trail to Saddleback Lake. This trail wins the award for both the most difficult and the most adventurous. 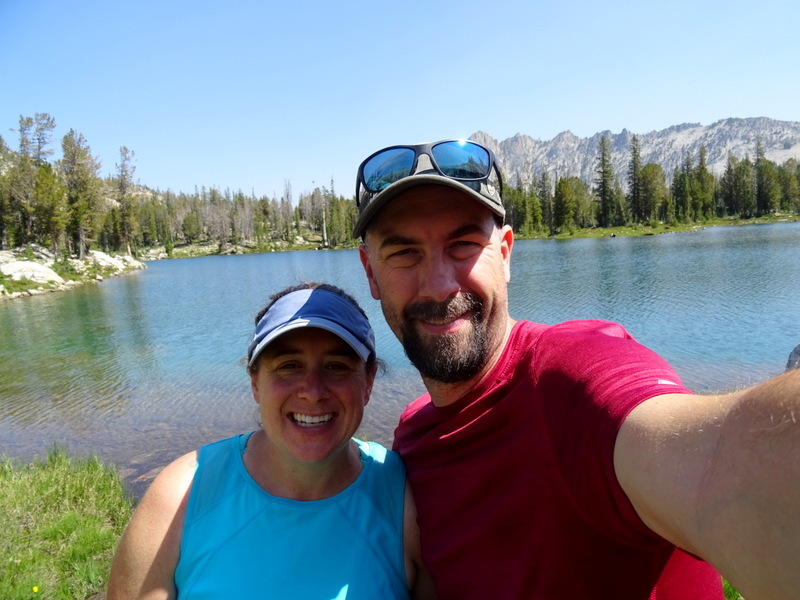 On the adventure side, the hike started with a 4-mile boat ride across Redfish Lake to get to the trailhead. Once we landed on shore, the first two miles were pretty tame, but then we crossed the river and the real adventure started. 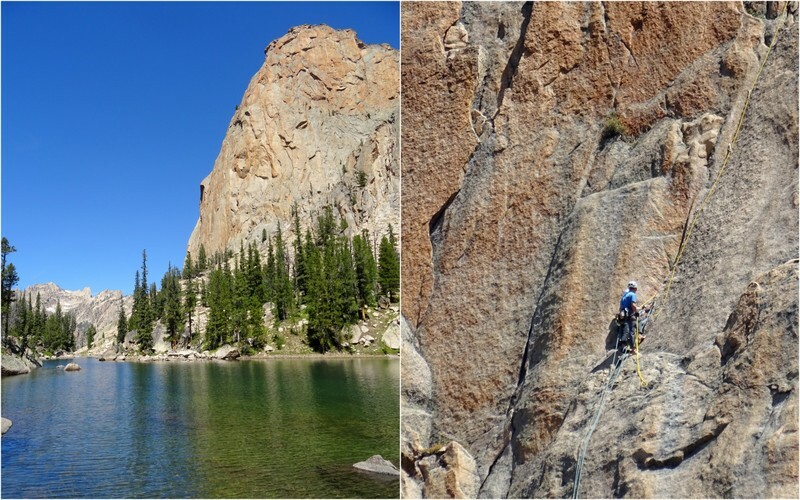 Despite being a popular route for hikers and climbers (there’s a giant cliff at the top for crazy people to scale) there is not an official forest service trail up to the lake. Instead, there are a number of braided trails that wind up the mountain. As a result, we lost the route numerous times and even back tracked once or twice to find a better route. On the way down we ended up on a different path altogether and completely lost our hiking companions, Taylor & Beth, for most of the way. Not only would an official trail have made this an easier hike, but one single trail would certainly have less impact on the land than the 10+ winding routes. On the difficult side, this trail was crazy steep! A few times it felt like we were climbing straight up. The steepness combined with the boulder fields we had to pick our way across and the route finding made this one challenging hike. I feel kind of bad that we took our friends with us because they were not yet acclimated to the altitude and had to work extra hard to reach the top. They were troopers though and once we rested at the lake everyone was all smiles. Seriously, look at that view! One other thing to note about this trail. 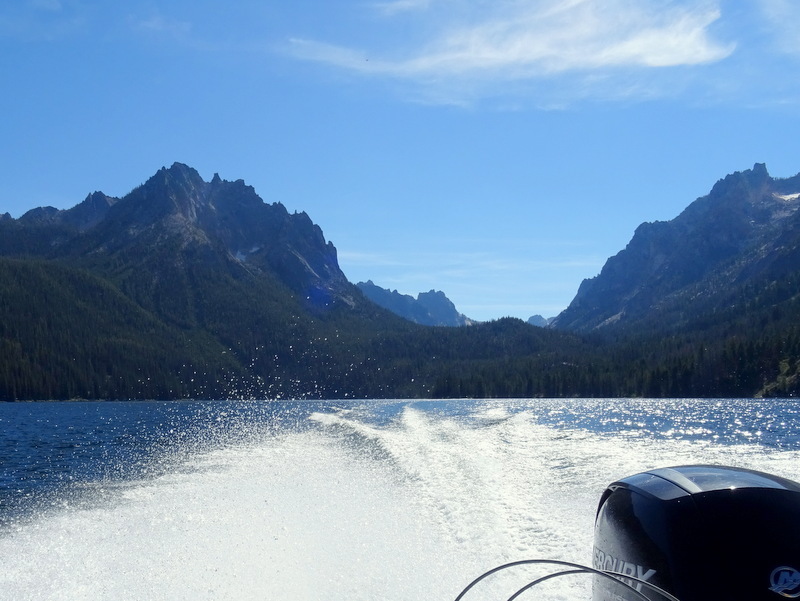 The boat leaves from Redfish Lodge whenever two or more people are waiting, but to catch a ride back you need to make a reservation for one of the hourly pickups. Unfortunately, we severely under estimated how long it would take us to hike this trail and ended up missing our return reservation by an hour. We based the time on our previous hikes in the area but didn’t take into account the extra time needed for route finding or how steep the trail was. In the end, it was fine because after waiting only 15 minutes the boat showed up with some hikers and was able to take us back. But if we did it again (and we would do it again) we would make a later reservation. Not only was the trail hard, but the lake was gorgeous and we could have easily spent a lot more time up there. 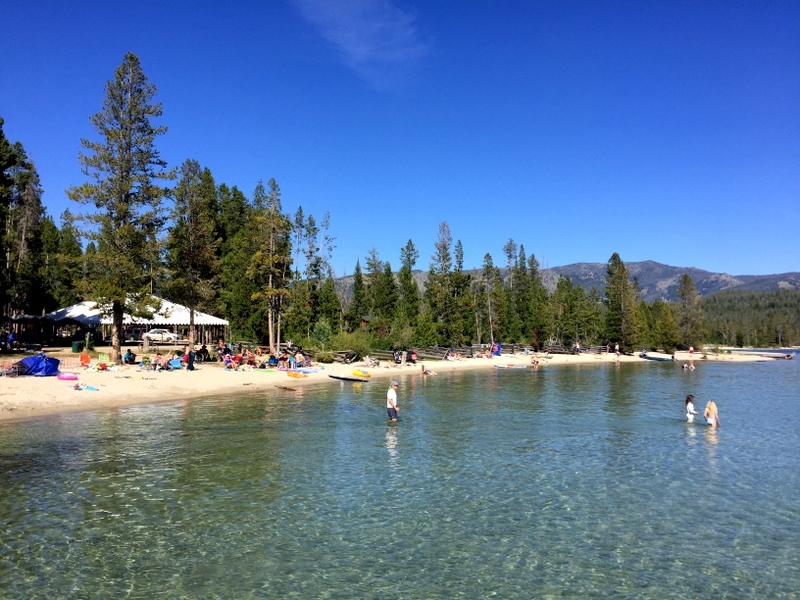 This is the beach at Redfish lodge where we caught the boat. If those evergreens were palm trees you would think it was a tropical island. 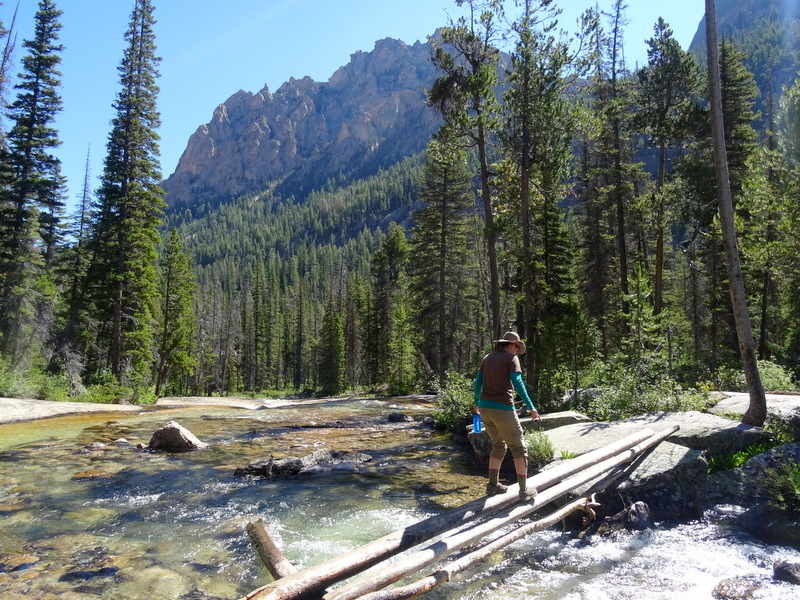 Of course, hiking is not the only way to experience the Sawtooth Mountains. We jumped on our bikes a few times to explore with our wheels. 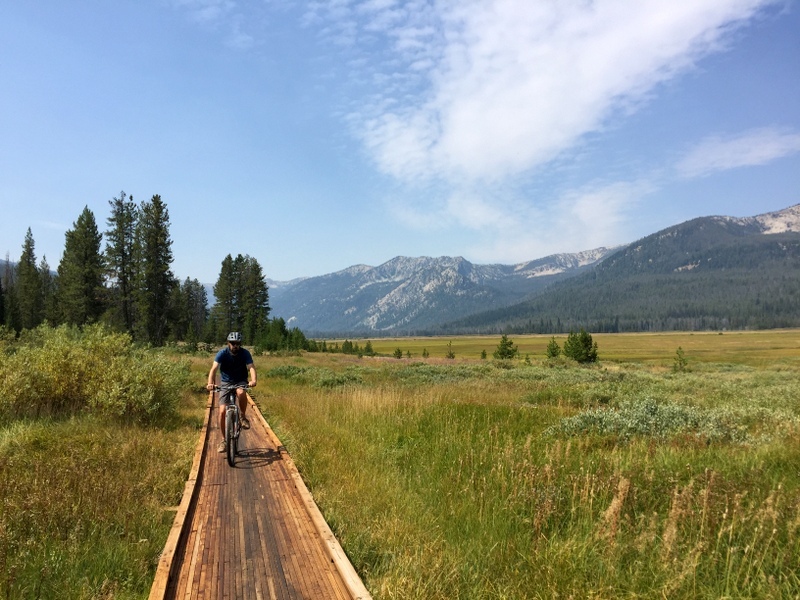 While I’m not personally a fan of biking up huge mountains, I surprised myself by enjoying a trail called the Elk Meadows Loop so much that we did it again a week later. I wouldn’t say this is an easy trail, but it’s also not terribly difficult. The hardest part is the beginning where you have to climb up 2 miles of jeep road before plunging into the woods down a rocky section of single track. This type of narrow, rocky trail used to be my nemesis, but since I got a new mountain bike a few months ago I feel a lot more confident tackling technical trails. 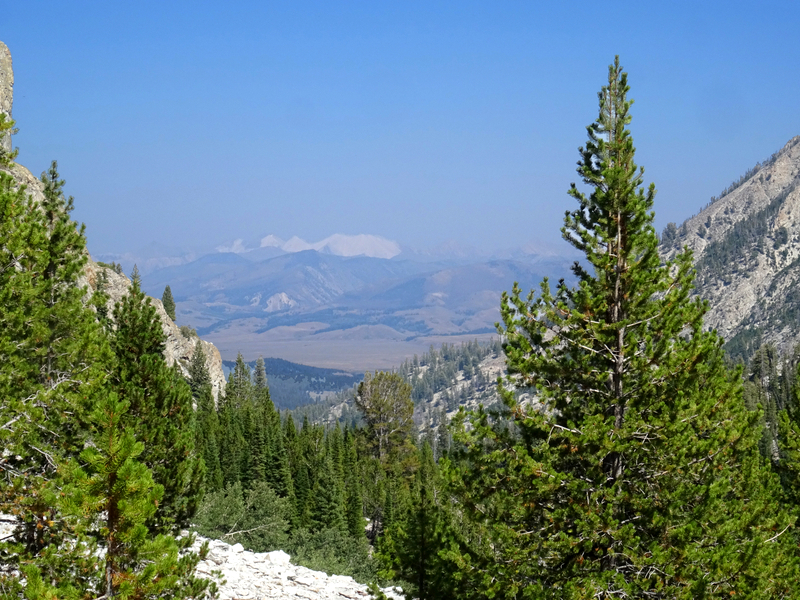 Once you make it through the first few miles, the remaining trail travels up and down through meadows and along some narrow ridges. At 12 miles total, it made for a great after work ride and was a nice change of pace from hiking. We also put the kayaks in the water a few times. 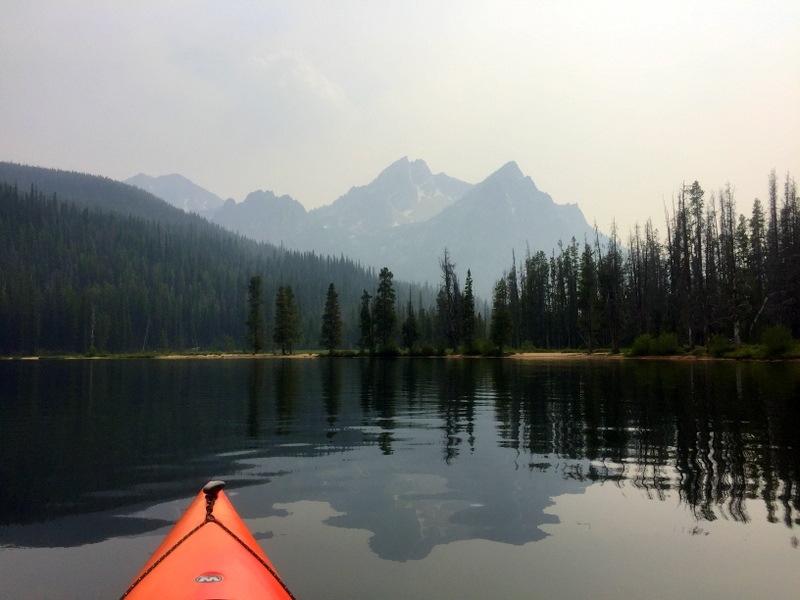 One afternoon we paddled around the Stanley Lake with some friends. 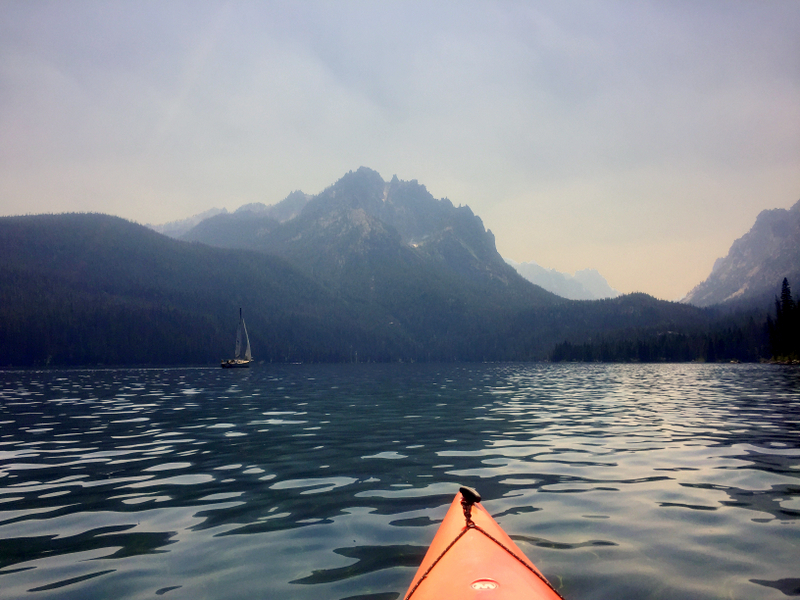 It was extremely smoky that day, but the lake was very calm and you could just make out McGown Peak in the distance. 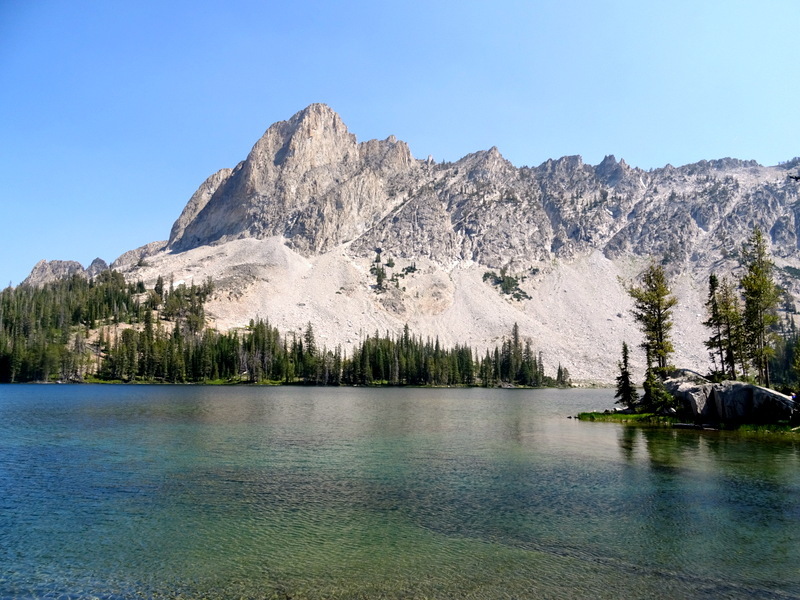 Redfish Lake is the big one in the area. Once again, we gathered a small group for another afternoon paddle. It was a little wavy, but still a good time. A week or so later, Tim & I went back to Redfish for a more leisurely weekend day paddle. 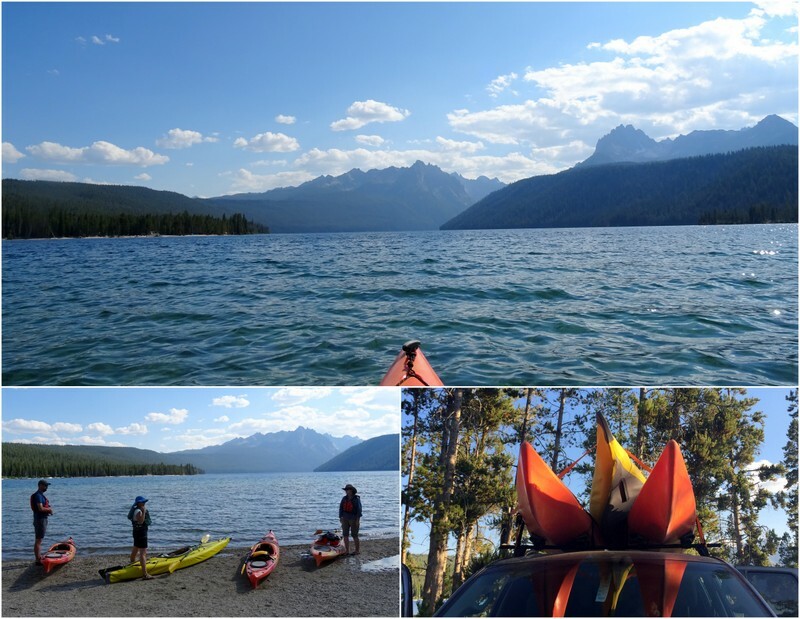 It was hot that day so we found a small stretch of sandy beach about halfway down the lake, parked the kayaks and jumped in for a swim. We did not stay in long. Even at the end of August, that water was freezing! We bundled little Logan into his life jacket and took him along for the ride. 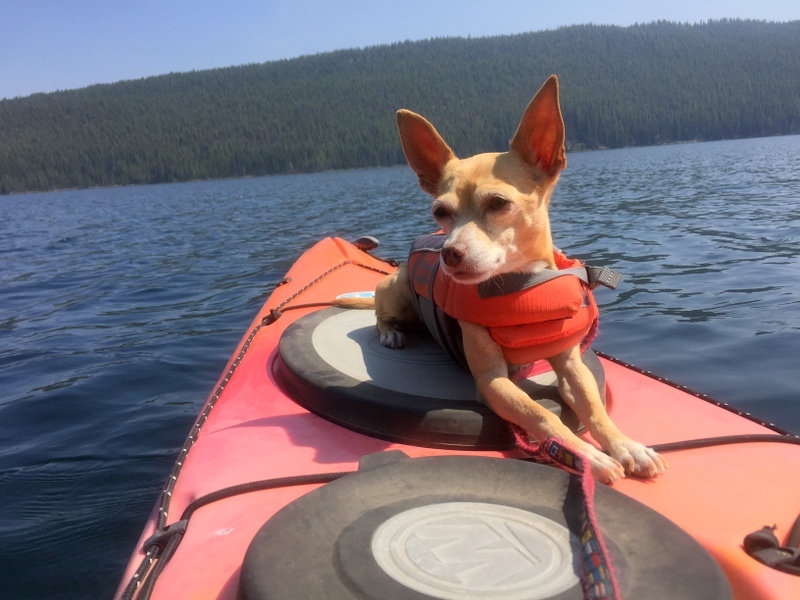 Despite not liking water (he won’t even get his tiny feet wet) he’s a very experienced kayaker and happily rode on the back of my boat the whole way. And with that, we wrap up our month in Stanley. 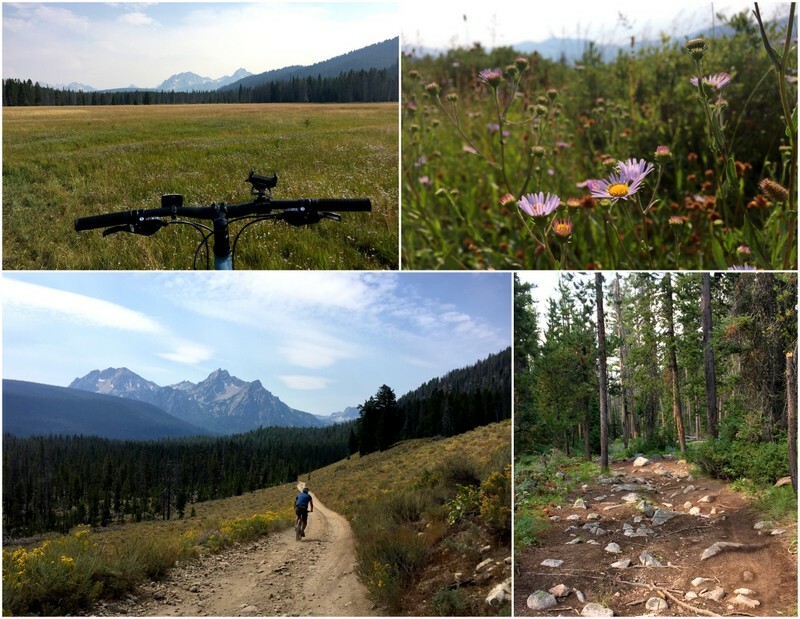 Between the super social eclipse gathering and all the fun outdoor activities, it was quite a month. Despite spending so much time there, we both agree that a return trip is in order one day. Maybe next time we’ll come earlier in the summer when the entire northwest is not on fire. It really was too bad about the smoke. For the month we stayed in Stanley, it was smokey most days. We did have an occasional day when it cleared up, but I still feel the need to go back and see it when the conditions are better. Wow, your time in Stanley looks amazing! We’ve not made it there…yet, but I can see that we would love it! There really is nothing better than an alpine setting. Oh, and Logan is pretty darn cute! You would love Stanley! Somehow I missed taking any photos, but the town itself is really cute and there’s a tiny Motel & RV Park with a half dozen full hook-up sites right off Main street. 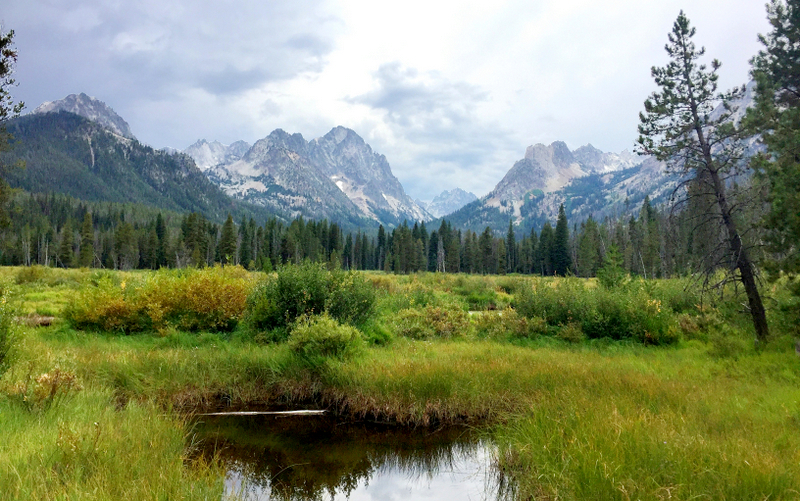 Your photos of the hikes are past stunning! What a beautiful area you were able to experience … Do you have a favorite? 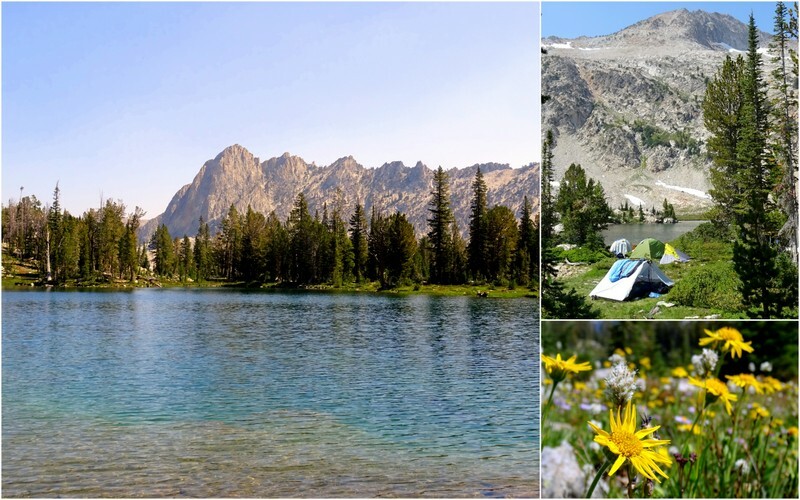 I’ll take Twin Lakes – such pure water and fabulous scenery. I think Twin Lakes was our favorite. The amazing color of the water combined with the cliffs that plunged down into the lakes was amazing! 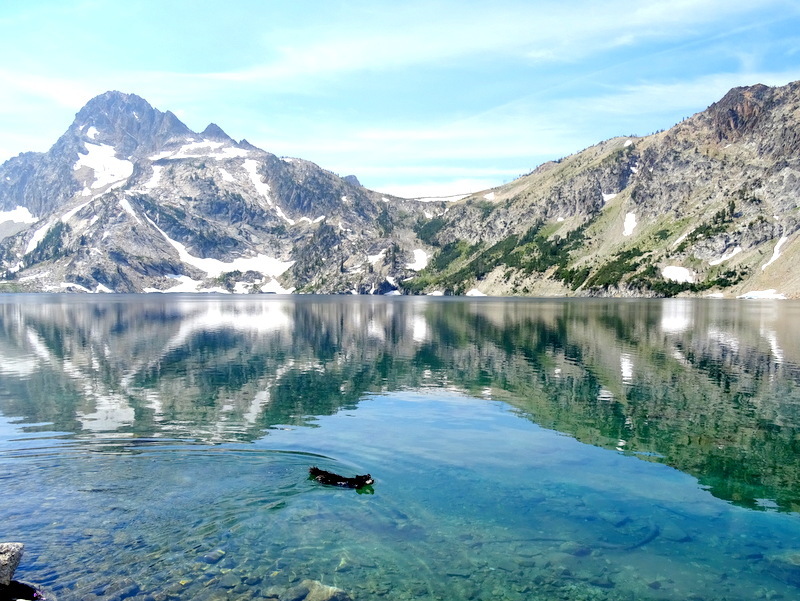 Also, most people only go to Alice Lake and then turn around so we had the shores of Twin Lakes practically to ourselves. Beautiful pictures. We were there last summer and hated to leave. After seeing your pictures we may have to return next summer. It certainly is a place that makes you want to stay awhile. We would definitely return for a repeat visit. Oh my goodness, that looks stunning! 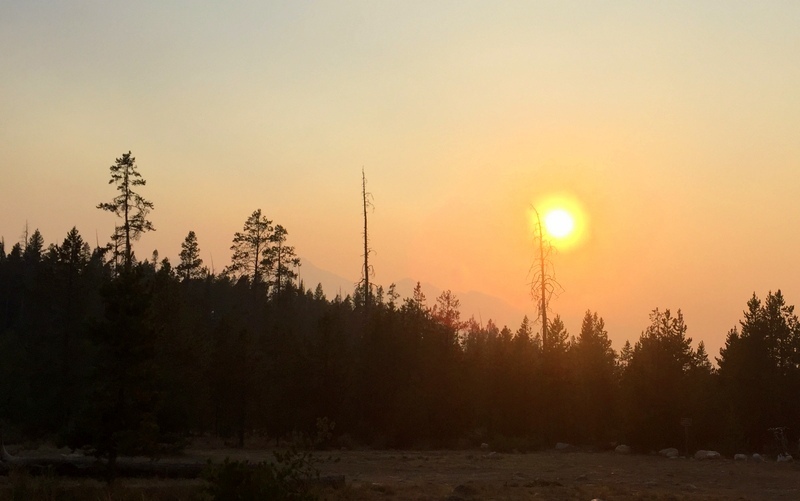 We just cancelled a trip to the Canadian Rockies due to all the smoke and haze in that area because we wanted to experience its full beauty. But I’m glad you still got these amazing shots! I don’t blame you. After seeing the Canadian Rockies smoke-free a few years ago I too would wait until clearer weather. Fortunately, because we were in Stanley for a whole month we did have some smoke-free (or almost smoke-free) days. As always your photos, stories are entertaining. I had a small leak during a day of rain, could not determine the source, patched a likely spot with Gorilla duct tape, temporary of course. Has a similar problem occurred during the wanderings? Oh yeah, we’ve had our share of leaks. In fact, our front window still leaks on occasion even after resealing it. Seems like part of the RV lifestyle. We figure as long as we don’t have so bad of a leak that it rots the floor we’re doing okay. How’s your dad? Did he survive the hurricane? Thanks for asking! He lives in Vermont this time of year, but as far as we can tell from the photos his house and yard on BPK are still there. Lots of flooding and damage, but the roof is on the house which is more than some people can say. He’s headed down there to start the cleanup process in a few weeks.